If you sometimes feel like you are standing on a marble stone or folded sock, chances are high you have developed Morton’s Neuroma. It’s a painful condition arising as a result of thickening of the tissue surrounding the nerves leading to your toes. Let’s look at the most frequent symptoms and causes of Morton’s Neuroma, the importance of good shoes for neuroma and review 5 best shoes for neuroma. Congenital or inherited musculoskeletal defects. Frequent wearing of high-heeled shoes especially those with narrow pointed toe box area. These kind of shoes cause over-riding of the metatarsal bones on each other, making them to overlap. Morton neuroma is a serious condition and any indication should be addressed quickly. It can become so distressing that treatment requires corticosteroid injections or even surgery. The overwhelming proof that this neuroma can be traced to ill-fitting shoes is the fact that most sufferers experience immediate or gradual relief by changing to lower heeled shoes with roomy toe box area. Research and studies show that certain footwear can make you more prone to develop Morton’s neuroma. In fact, this article by Medical News Today, specifically identifies high heeled shoes as a common cause of Morton’s neuroma. You can read that here. Another article by Orthopedic Product News states that reports of Morton’s Neuroma have more than doubled over the last 10 years with women reporting the worst cases that require medical intervention. The rest of that article can be read here. Correcting the situation before it degenerates to the stage of requiring surgery is of essence and good shoes do help and can even restore the foot to its right alignment. Always try shoes on before purchase. Stand and move around in them too. Ensure you are comfortable before buying. Get shoes with good arch support, especially for those with active lifestyles (runners and other athletes). Depending on how advanced the neuroma is, you may have to stick to very low or zero drop shoes to avoid any pressure on the ball of your feet. Choose wide toe box shoes to avoid metatarsal bones overlapping. Feet tend to swell as the day progresses. Buy shoes that give your feet a bit of wriggle room. Specifically designed to take pressure off the forefoot area, this Portuguese shoe company is popular for soft and stretchy uppers combined with moderate support and cushioned insoles. This particular model is highly recommended on the list of best Morton neuroma shoes. It features an orthopedically designed outsole incorporating twin arch supports to distribute your weight evenly. The cushioned footbed is a mix of soft latex and cork, with leather upper body and an elasticated instep. Available in 14 colors including 3 shades of black. Pros: Leather stretches comfortably in the toe area. Cons: Runs a bit small so order half inch larger than your typical size. A few users complained of the elastic strap rubbing against the upper foot but it takes some getting used to. Newton Running is another popular brand for Morton’s neuroma shoes. The Women’s Fate Shoe has a seamless mesh upper for breathability and designed to reduce irritation and chaffing while walking or even running. It comes with ETC Sockliner for an anti-bacterial underfoot comfort and a generally healthy foot environment. The Midsole is shaped for underfoot cushioning, with unified Action/Reaction Technology system which is utilized in the heel and forefoot. Among other features is bio-mechanical metatarsal sensor plate at the forefoot which allows you to feel the ground, and relays constant sensory feedback with each step. Pros: Good reviews from users, very comfortable. Cons: You may have to order half size larger to get a comfortable fit. Clogs are good for Morton’s neuroma due to their roomy toe box and moderate heels. 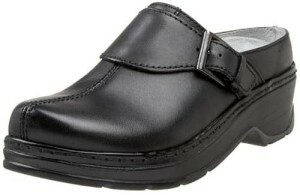 This model is a combination of comfort and classic look and has leather upper body, synthetic sole and 2 inch heel. It comes with a detachable insole so you can choose to wear it with custom orthotics. The MaxumTM PU sole is slip-resistant, shock absorbent and mark-resistant. Pros: Attractive style, recommended for a variety of feet problems. Many users report quick relief from foot pain. Cons: Runs big, confirm size before purchase. 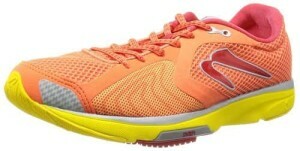 Another shoe for neuroma by Newton Running, this time for men. The upper body is breathable mesh with lace-up padded tongue and collar and firm grip rubber sole. It has 360 degree reflectivity for poor lighting conditions and features the trademark mid-foot to heel Action/Reaction Technology. Available in an orange/silver/yellow mix. Pros: Very lightweight and comfortable. Cons: The color may be too bright for some men’s taste. 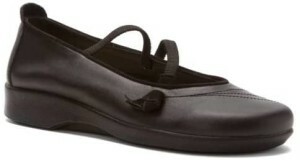 This Orthofeet model is a dress shoe for a variety of feet problems including Morton’s neuroma. It comes with its own Gel orthotic multi-layer insole for arch support, and relieves heel and general foot pain. Designed to soften each step with smooth, soft inner fabric lining. 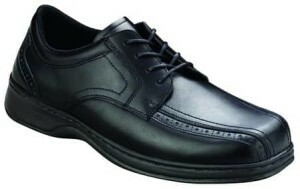 Roomy toe area and non-binding relaxed fit in a classy and attractive Oxford design. Pros: Soft and light, good fit for most users. Highly recommended for a variety of foot problems. Cons: Not designed for rough handling. Morton’s Neuroma is a very serious and progressively debilitating foot condition that should be arrested quickly. Taking care to select the best shoes for neuroma can prevent a more resistant form of the condition from developing in the future.